Joe Oshiro, at the tender age of 29, has come up with possibly the best and wisest description of VIP style. “It’s not about rockin’ knock-offs and going cheap. It’s about having a high-quality vehicle and rockin’ high-quality parts.” And English isn’t even his first language. When he was growing up in Okinawa, Japan, Oshiro would stay up late and watch the street drifting that happened regularly at Aja Port. But now he’s a man and has put away childish things-he’s rockin’ VIP these days in an ’01 Lexus GS430 painted Noble Spinel Mica (a color from the bigger LS series palette), with cool double fog lamps sourced from a Mercedes-Benz S-Class and a trunk shaved of its emblems. It just so happens that this current resident of San Diego, CA, has one massive VIP resource right on his doorstep: the very industrious people at Autofashion. Don’t feel too sorry for Oshiro. 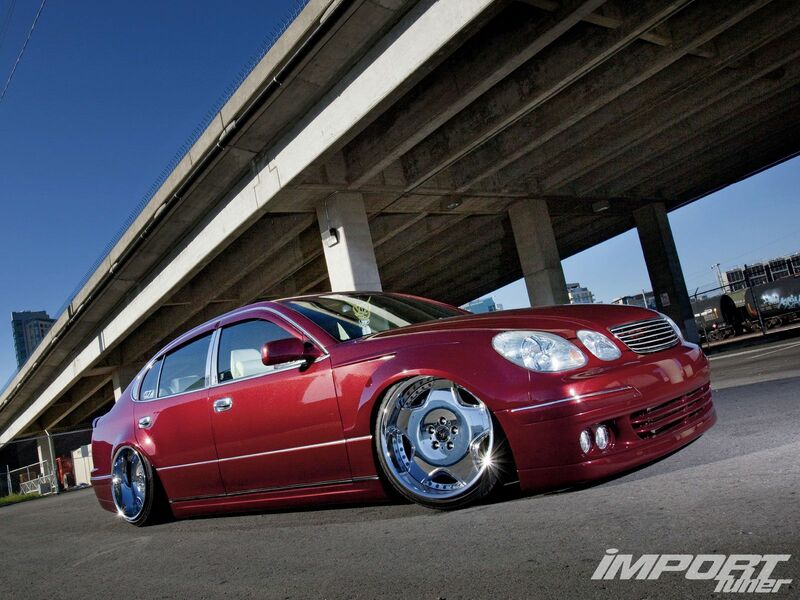 He won First Place VIP at HIN Los Angeles in 2009. Same kind of thing at Spocom, Long Beach, CA, for two years running (2009 and 2010), Extreme Autofest, plus a few other bits of silverware for the trophy cabinet. 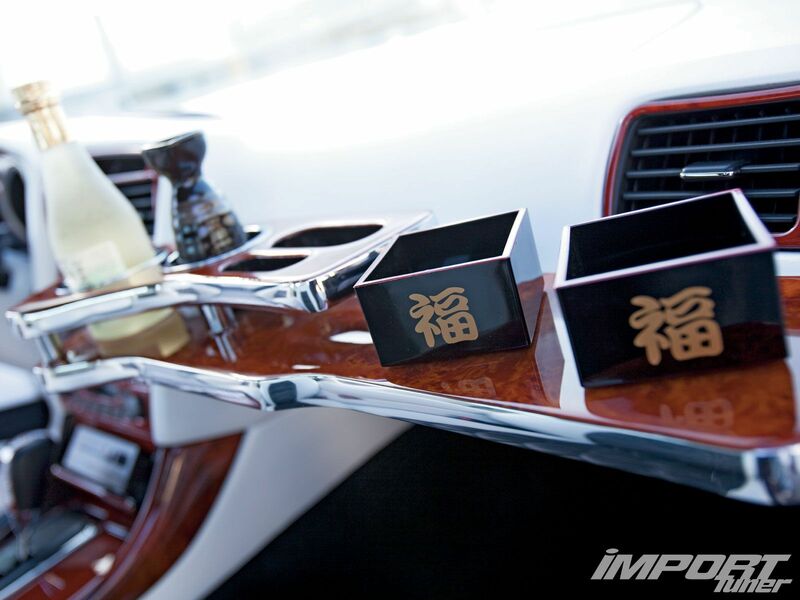 Second time around (“to build a true VIP car”), Oshiro credits Autofashion for the guidance. Some original modifications stayed on, such as the Junction Produce grille and the Air Runner adjustable air suspension with its Viair 480C compressor, added so he could slam the car down lower than a snake with the blues. But not before changing the bodywork. The car now has a full K-Break kit, plus a Junction Produce rear wing and chrome highlights, with custom flaring front and rear to accommodate 19-inch, super-rare Lock Smice Duke rims, which are secured by Bersaglio Crystal lug nuts (with real Swarovski crystals. “I can’t rock any fake stuff,” says Oshiro). Stretched over the wheels are Falken FK452 tires-all this work in search of the perfect stance. 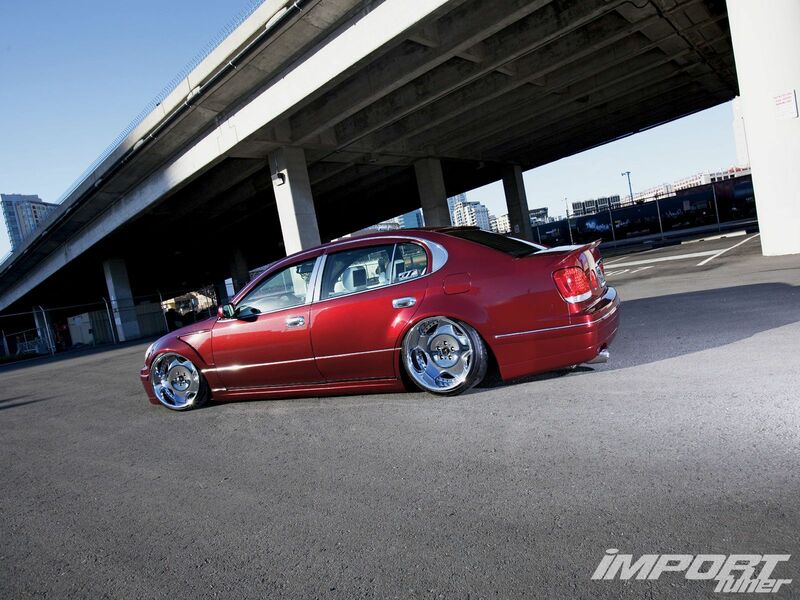 Which is one of the things, Oshiro says, that sets his car apart from other VIP builds. Another thing is its supercharged engine. It’s still the same 3UZ-FE, 4.3-liter, quad-cam V-8, but now it has a Procharger C-2 blower (controlled by an LMS I-manage piggyback unit), plus a Spearco front-mount intercooler, and exhales into a Tanabe Medalion Touring exhaust system, designed especially to combine efficiency with discretion. The car’s extra thirst is sated by a Walbro 255 lph fuel pump, while its extra thrust (now a claimed 400 hp, up from 300) is contained by an Endless big brake kit with six-piston calipers up front. 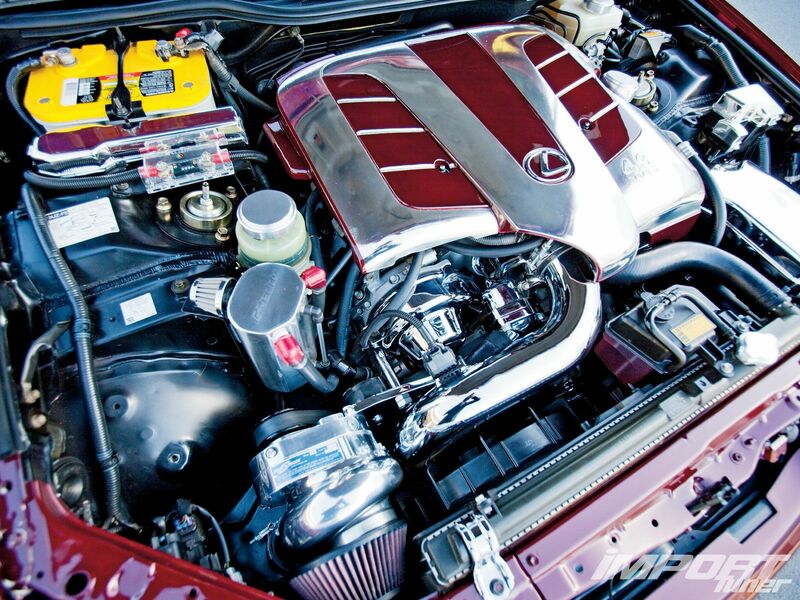 And because it’s the nature of this beast, there’s plenty of chrome plating and Carson Tuned billet trinkets in the engine bay. Since we’re on the subject of shiny things, check out the cabin’s glittery Garson Lux Crystal shift knob. It’s fairly easy to see because, shockingly, Oshiro has ditched the curtains. “I feel they’re starting to get played out,” he says. “Maybe it’s just me, but I think it looks cleaner without them, plus I can show off my interior more.” Obviously, those car show judges didn’t have a problem with it. And if nothing else, it illustrates how the VIP style-like everything else-is constantly changing and evolving, keeping things interesting. 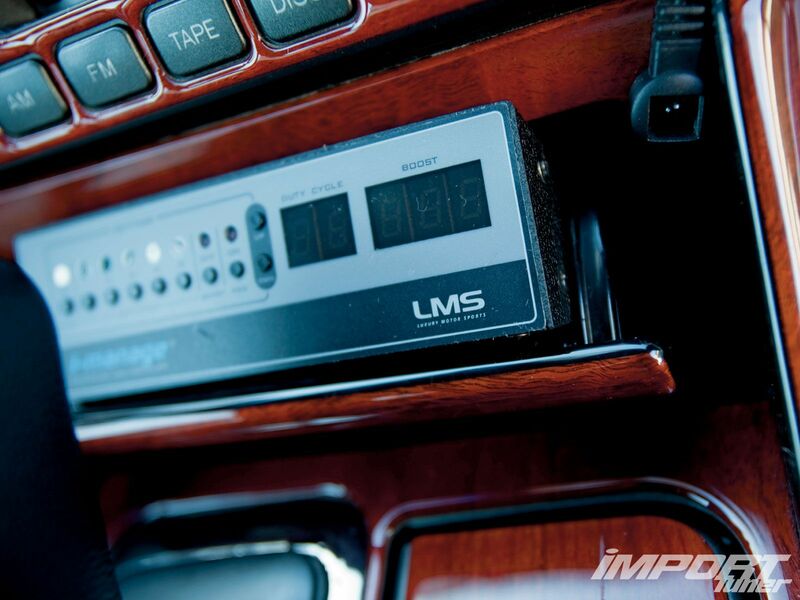 Although the Mark Levinson stereo system that comes with Lexus cars is full of sonic goodness, Oshiro decided to amp it up with Arc Audio, um, amps. 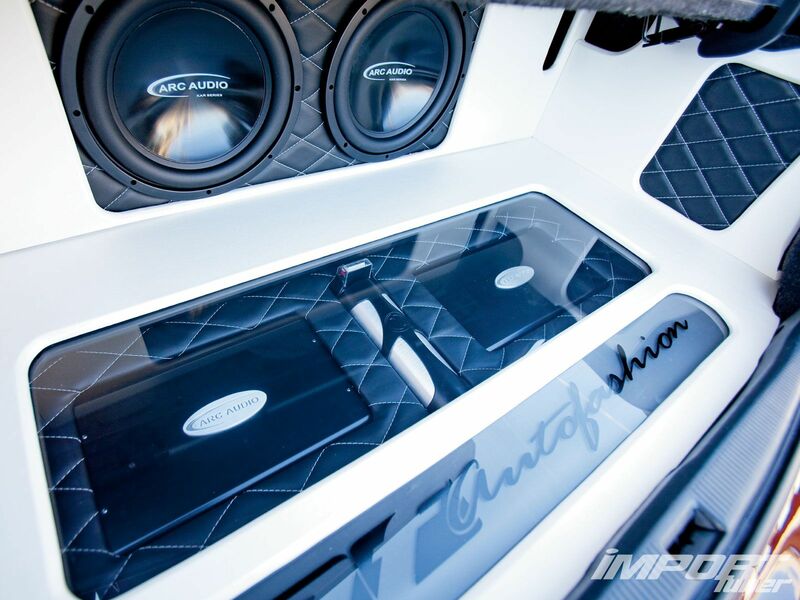 They can be seen along with a couple of Arc Audio subwoofers displayed neatly in the trunk. The whole shebang, she bangs out 1,400 watts. But that’s still not as loud as the black and white, diamond-stitched, leather upholstery. Really black, really white, and on the seats, door panels, center console and dash. This task-along with the engine work, electronics, and suspension installation-was carried out by Autofashion. Just to remind passengers that they’re traveling first class, the lavishly varnished, custom-made wooden tables wouldn’t look out of place in a limousine. First class tickets cost big money and Oshiro has sunk more than $40,000 into this car. “Make sure you have deep pockets and stay away from replicated products,” he says. “You get what you pay for.” He makes perfect sense, but here’s something really crazy, almost unheard of in the tuning world: Oshiro says the car is complete. Done. How will he spend those long winter nights without a project to cozy up to? “Once a car guy, always a car guy,” he says. “It’s like a bad addiction you can never break. Right now, I’m working on an old-school ’71 Toyota Celica with an LS2 motor conversion.” Might be time to start looking over your shoulder for the cops again, Joe.